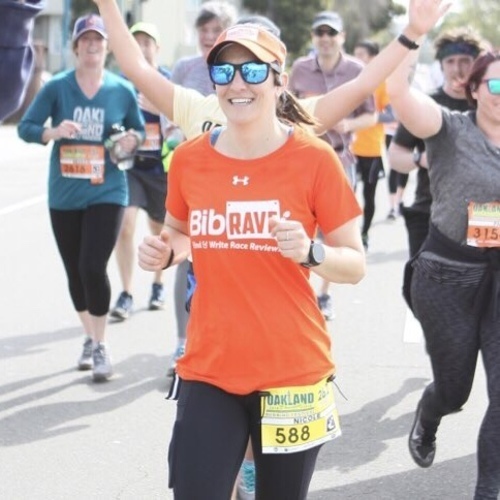 Such a great experience with running the Oakland Half Marathon! The communication from them leading up to the race was always really clear and helpful, with tons of updates about what to expect on race weekend, which I love because I am a planner. The expo was really easy to get to and had parking. A lot of other local races were there, so it was fun to walk around and plan out my race calendar a bit! The t-shirt was a good material, not a running fabric, but that works for me. No line to pick up my bib, which is so great compared to some other races I have seen. Race morning was a bit different for me. The half didn't start until 9:30am, which I am not at all used to, but kinda ended up loving! Got to sleep in a bit, have coffee, and breakfast, before driving into Oakland. There was no traffic and tons of neighborhood parking less than half a mile from the start. They had tons of ports-potties and no line for those either. Just a super chill and easy race morning, can't ask for anything better than that. The race started on time and they had pacers for the half, which I ran almost the entire race with. They seemed pretty good about staying true to time. The course was okay, you are running through the city of Oakland, so if you are looking for a scenic race this isn't the one. But I love city races so seeing all of the wall murals in Oakland was great. Plus the city comes out hard with support!! 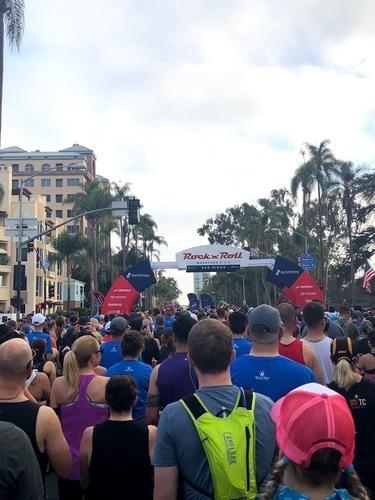 There was barely an empty section in the whole 13.1 miles! Finish line was great, they had the marathon and half marathon finishing at the same time in the same chute so it was a bit packed. But right after the finish they had tons of water and food choices! More food choices than I have ever seen. Oranges, bananas, apples, popcorn, granola bars, fruit cups, more crunchy snacks, it was amazing! Past all of the treats were the medals, and they were just handing them out instead of putting them around your neck - which was fine with me - but if it were my first marathon I probably would have been a little bummed. The medals were great though! High quality with the bay bridge on them. Also, they have FREE race photos! By the morning after the race I had tons of great photos that were super easy to download - such an amazing perk!! Overall - a really great race that I would definitely recommend! I'm so bummed I had to drop to the half, was really looking forward to running over the Bay Bridge. But I am keeping my fingers crossed that the course is the same next year and I can try it again! Loved this race! So well organized, with great swag, and a beautiful course. The net downhill is wonderful, and you are constantly surrounded by great views. Not too many people race so you aren't crowded the whole time. The bag the race gives out is great quality, one I will definitely continue to use. Plus the medal was super cute. They even have food at the end! Highly recommend!! Loved this race! It was my first Hot Chocolate race and it lived up to all the hype! Registration is through RAM racing and was super easy. Expo/Packet Pick-up was open on Friday night and Saturday from 10am to 6pm. It's at a convention hall down by the airport so it was a bit of a drive, but there were parking lots for the center so that part was easy. Getting my packet and bag was seamless. I really like the jacket that all of the runners get, it even has zippered pockets, which is vital in my book! Such a nice change from a race t-shirt that most people never use. Expo had lots of vendors, I talked to a few, but then headed out to have dinner. Race morning was a breeze. The 15k doesn't start until 8:10 (which is a bit late in my book), but it was kinda nice to sleep late on a race morning. There was a TON of street parking within a half mile walk to Golden Gate Park. Watching the sun come up at the park was gorgeous, and the energy was high. Everything was really well organized, including gear check, which was a pleasant surprise. There were some people not lining up in the correct corrals, but that is to be expected. The course was BEAUTIFUL!! I loved running through the park and along the water. It was a bit of everything over the 9 miles. There were 4 aid stations with chocolate and marshmallows, nuun, water, and lots of porta potties. Post race celebration was great. I got my hot chocolate and all my goodies. Lots of things to dip in melted chocolate - which was SO fun at 10am!! Plus the medal is really cool! Overall I really loved this race and cannot wait to do another HC15k! Loved this race! 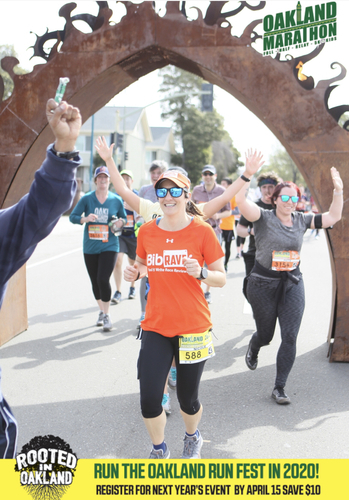 Running over the Golden Gate Bridge has been on my bucket list and this race was the perfect time to do it. The views were breathtaking! The hills were not at all as bad as I was expecting, totally manageable. Plus the aid stations had plenty of water, nuun, and honey stinger gels. Such cool medals too! The race shirt is a great long sleeved tech tee with a simple but really nice design. Definitely one I will wear in training all the time (especially when it's cold)!! Only tricky part to this race is parking, both for the expo and the actual race day. The expo was in a nice area, not many vendors, but luckily the city easily makes up for it. I'd love to do this race again one day!! Absolutely loved running this race! Getting to wind through the streets of San Diego did not disappoint. The most difficult part was running up the highway at mile 22-24, but there was an aid station right before that and during so it made it more bearable. Plus they had ice cold, water soaked, sponges - which are one of my all time favorite aid station things. The support from the local community was wonderful, and people were out cheering at most sections. Very motivating! Not a huge fan of their on course nutrition, but I carried my own and just refilled with their water. The expo left a little something to be desired, but I tend to judge races more on the actual race. Parking is always a bit difficult for this expo location, unless you want to pay $20 to park at the convention center, which just seems like way too much for me. I parked about a mile away for $5 and just walked. Luckily I live in San Diego so I'm pretty comfortable with where things are, not sure if I would have done the same if I weren't so familiar with the area. The expo had a lot of booths, but it just did not live up to what I had heard about from past races. Not enough to deter me from registering again. I will say, I had to move my corral up and it was super easy to do! I just walked right up, told them which corral I wanted, and they corrected my bib. It took about 3 minutes! Loved the t-shirt and the medal, both felt pretty SoCal to me. Looking forward to doing this again!